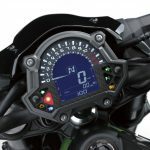 For all those traditionalists/purists who bemoan modern motorcycle electronics (TC, ride modes, electronic suspension, etc. ), Kawasaki has a bike for you. 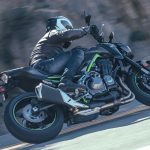 The 2017 Kawasaki Z900 in this review is lighter and more agile than either the Z800 or Z1000, is more powerful than the Z800, costs way less than the Z1000, and is devoid of electronics save its gear-position indicator. Kawasaki did outfit the Z900 with mechanical technology in the form of an assist and slipper clutch – which makes for an incredibly light pull at the clutch lever, and the ability to bang a series of downshifts without fear of hopping the rear wheel uncontrollably – but otherwise the bike is elemental: engine, frame, suspension, brakes. 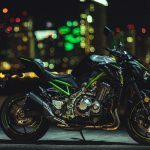 Correctly combining those four ingredients remains a delicate balance, but with the Z900, Kawasaki appears to have a winning package. 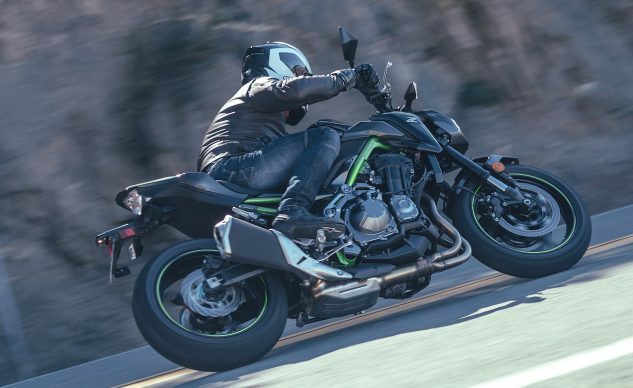 Beginning with claimed curb weights, we see the Z900 at 463.1 pounds (ABS model, 458.6 pounds for non-ABS) is 24.2 pounds lighter than Z1000 (487.3 pounds), and a whopping 46.3 pounds lighter than Z800 (509.4 pounds). 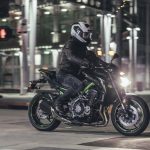 Like the Ninja 650 and Z650 we recently tested, Kawasaki’s weight-loss program can be seen across the new-for-2017 spectrum, as those motorcycles also enjoy considerably lighter curb weights. 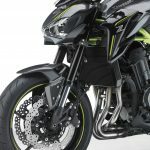 In the big picture, lighter curb weights that are new to Kawasaki only get the Z900 closer to the weights of competing models. These claimed curb weights (* extrapolated from claimed dry weights), tell a story of Kawasaki still having a ways to go in the weight department. A future shootout will better reveal actual curb weights and performance advantages/disadvantages. It should be noted that among these four the Z900’s $8,399 MSRP is the most affordable. Even with its hefty wet weight, the Z800 managed to best the Suzuki GSX-S750 in our 2016 Gentleman’s Hooligan Comparo. 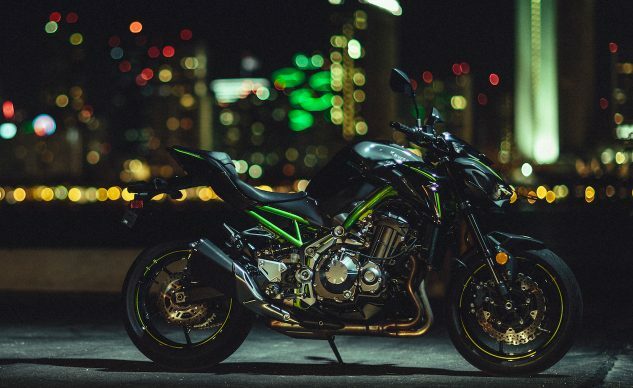 So, weight isn’t the be all end all when it comes to motorcycle performance, and it shows with the Z900. 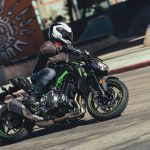 Weighing significantly less than the 800, the Z900 was almost guaranteed to be a better performer, and our day aboard the new Z in the mountains and canyons of San Diego county proved the new 900 to be an agile and capable naked. 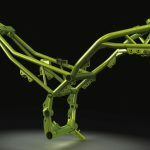 Kawasaki says a large contributor to lower weights of its new Z900, Z650 and Ninja 650 is the use of trellis framework. 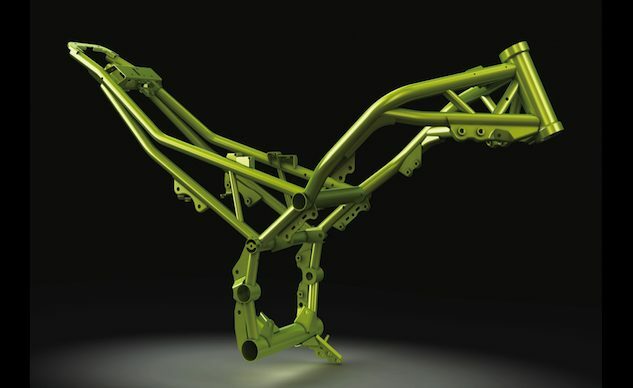 The Z900’s frame is claimed to weigh only 30 pounds. The Z900 welcomes quick transitions and confidently holds its line through long sweepers. The 41mm inverted fork, adjustable for rebound damping and spring preload, does a commendable job handling surface irregularities but is a little vague at communicating precisely what’s happening at the front wheel. 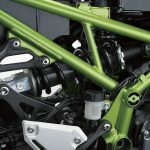 The same can be said of the rear monoshock (also adjustable for preload and rebound), but considering the bike’s price point, both suspension units are a reasonable compromise. The Z900 exhibited precise high-speed handling manners, while Dunlop Sportmax tires provided sure footing. The lack of traction control was always in the back of my mind, but linear power production coupled with excellent throttle communication and perfect fueling made easy work of applying power to the rear wheel. Power production from the 948cc inline four-cylinder is linear across the tach with a noticeable uptick in rev speed around 6,000 rpm. I noticed the tach naturally sitting around 5,500 rpm during spirited riding, ready to smooth into the meat of the Z900’s power curve. Sans traction control, the easy-to-use power delivery is certainly welcome, but those who like to feel acceleration will appreciate the 6k-rpm bump. 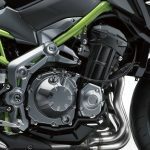 Z900 riders will also appreciate all the effort Kawasaki put into developing the bike’s intake snarl. Inhalation noise grows evermore pleasant as revs swing past the 6,000 mark toward the bike’s 11,000 rpm redline. 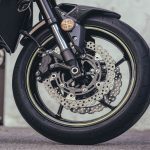 It’s a cacophony only the rider hears, and so serves a secondary purpose of leaving those around the Kawi unoffended by what appears to be a quiet motorcycle. 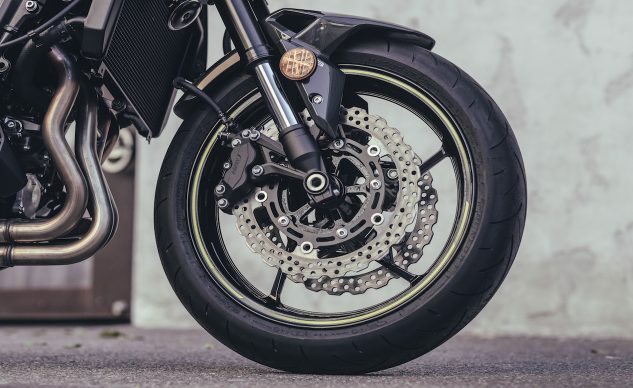 Dual 300mm discs and 4-piston calipers provide impressive stopping power, but without some of the feel and control you get from more expensive units. Both the front brake and clutch levers are adjustable. On the freeway at 75 mph, the inline-Four is spinning just below its power threshold, making passing an easy chore. And at nearly every speed regardless of gear, the Z900’s engine remained remarkably smooth, with no excessive secondary vibrations emanating through the seat, footpegs or handlebars – not something we often say about four-cylinder engines. The Z is easy to maneuver around town and at parking-lot speeds thanks to a wide steering angle. 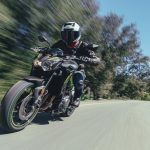 The Z900 has its rider in a comfortably aggressive seating position with enough forward lean to help with wind blast, and a relatively short reach to not-too-wide but not-too-narrow handlebars. 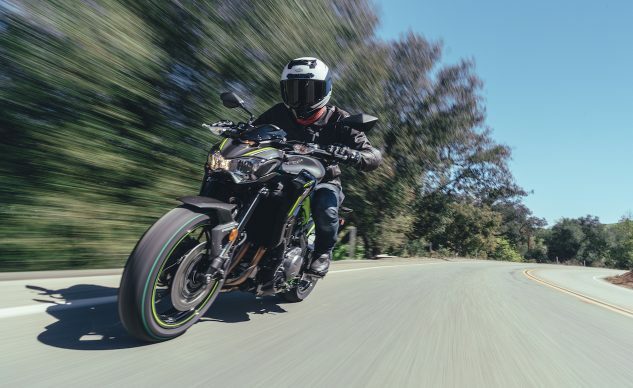 When testing the Ninja 650 a while back, we complained about the shortage of legroom for taller riders, but even though the Z900 enjoys a lower ride height of 31.3 in., compared to 32.8 in. and 32.1 in. for the Z800 and Z1000, respectively, I didn’t notice any knee cramps by the end of the day. Speaking of inches, it was interesting to note that the Z900 has a slightly longer wheelbase (57.1 in.) compared to the 800 (56.9 in.) and 1000 (56.5 in. ), but it still felt more nimble than either of those bikes. 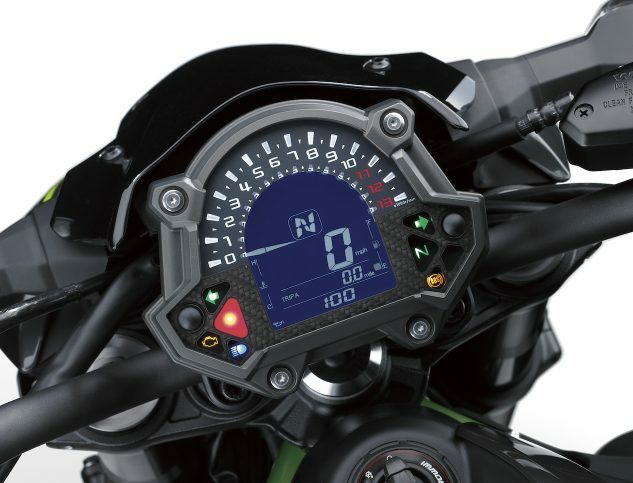 The instrument cluster is a combination of digital speedo and digital/analog tach, that also acts as a shift indicator. There are three different configurations for setting a shift indicator, none of which we were overly impressed with. The low fuel light came on at 100 miles, with the range counter indicating 50 miles to go. If the 150 range is correct, that earns the Z a 33.3 mpg from its 4.5-gallon fuel tank. Note the GPI (here in neutral) in the center of the speedo. At $8,399, the standard Z900 costs the same as the outgoing 2016 Z800ABS. Add ABS to the 900 and the price goes up $400 to $8,799, but even at that price, it’s still $3,200 less than the Z1000ABS. Having ridden all three Zs, we’re willing to say that the Z900 is better than both of its siblings with room to spare. How it stacks up against its current competitors (FZ-09, Street Triple 765, Brutale 800) will be fun to investigate. 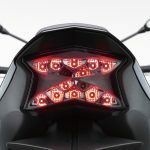 Kawasaki refers to the Z900 as a naked with a “condensed Sugomi-inspired appearance.” What’s for sure is the Z900’s styling will prove to be far less polarizing than the Z1000. The green frame rails are an attractive subtle detail on the Pearl Mystic Gray/Metallic Flat Spark Black model, or you can get it in Metallic Flat Spark Black without the green highlights.